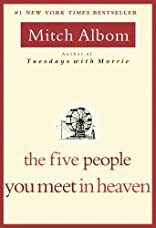 The Five People You Meet in Heaven was written by Mitch Albom. The Five People You Meet in Heaven was published by Hyperion Books, Scranton, Pennsylvania, U.S.A. Publisher Hyperion Books, Scranton, Pennsylvania, U.S.A.
About Mitch Albom (Author) : Mitch Albom is a published author. Some of the published credits of Mitch Albom include The Five People You Meet in Heaven (Random House Large Print).